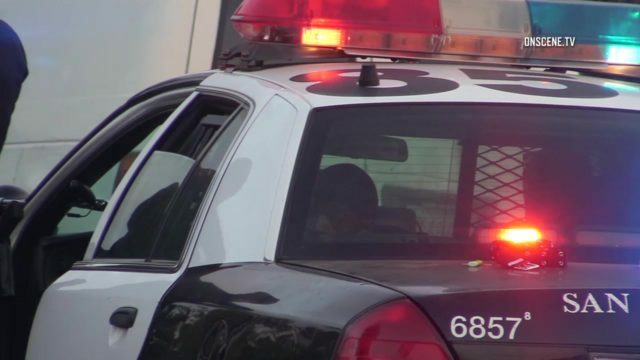 A San Diego police sergeant was injured Thursday in a three-vehicle collision at a San Carlos intersection, authorities reported. The lawman was driving a marked patrol SUV with its lights and siren activated, preparing to contact a possibly armed suspect, when he got into the pileup at Jackson and Golfcrest drives about 9:45 a.m., police reported. Medics took him to a hospital for treatment of non-life-threatening trauma, SDPD Sgt. Robert Hawkins said. The injured lawman’s name and details on the nature of his injuries were not released. Another motorist involved in the wreck was evaluated for complaints of pain, Hawkins said. At the time of the accident, the sergeant and other officers were responding a 911 call about a man possibly carrying a gun in the area. That reported sighting prompted administrators at nearby Patrick Henry High School and Myron B. Green Elementary School to keep students and staff secured indoors until further notice as a precaution. Police found nobody with a gun in the area, and the lockdowns were lifted just before 11 a.m., SDPD public-affairs Officer Billy Hernandez said.